Home/Reviews/Highfield 2018 – Full Review! As with most German festivals, the area in front of the stage is divided into waves by barriers. Only a limited number of people can be in the first wave as a measure against injuries from overcrowding. There is a one-way system in place, in one side, out the other so that numbers can be monitored. While this can be frustrating if you miss out on a spot for your favourite band, it does make it easier to move within the crowd. Another difference that sets this festival apart is the German culture of “Pfand” which is a deposit you pay on bottles, cans and, at festivals, cups. This means every plastic cup is worth 2 euros that you get back when you return the cup, which helps make Highfield a green festival. Arriving on Friday, the weather was very hot and very dry. Across the campsite, heated matches of flunkyball (Germanys second national sport) were in full swing. It’s a classic game of ‘do well, get drunk’. Two teams stand across from each other, each with cans of beer at their feet. A ball is thrown at a half full bottle of water in the centre. If you hit, your team drinks as long as it takes the opposing team to rectify the bottle. First team to finish their drinks, wins. Once a camping spot was found there was only time for rudimentary peg work, just enough to mark our camping territory. Before we headed straight to the lake. A good swim provided a much needed cool down and relaxed us, ready for the weekend ahead. The tent was fastened down properly t, the “HighViech” – a fish-like creature – and festival mascotwelcomed us to the main site. Appearing for the third time at Highfield, Gogol Bordello kicked things off with their trademark gypsy punk. It was early evening and the crowd still small. However, what they lacked in volume they made up for in enthusiasm; dancing, jumping, jigging. Lead singer Eugene Hütz, sporting the classic punk look “shirtless with blazer”, directed the crowd with his energy. Mixing it up from the usual beer on stage, Hütz opted for a classier bottle of red wine. That didn’t stop him pouring it all over stage and crowd throughout his set. As the set went on, the New Yorker band drew a bigger and bigger crowd with their infectious tunes that you couldn’t help but dance to. Infectious but in a different, more hip-hop way, the 257ers took the blue stage by storm. The queue for the first wave was mounting as fans were eager to get up close and personal in the mosh pits. The band, named after their home postcode, started off with a three horror clowns accompanied by whimsical circus music, setting the tone for the one-hour set. Notorious for their costume changes, the duo dressed as pirates, Dutch football shirts and Hawaiian shirts, each outfit referencing a different song in the set. They were also accompanied by at least three extras on stage, dressed up and firing up the crowd. Costume changes take time, so to keep the crowd entertained the DJ played everything from nursery rhymes to crazy frog. At one point he got the whole crowd to crouch down but instead of the anticipated beat drop, Whitney Houston’s I will always love you rang out, much to the amusement of everyone. Refreshments were kindly provided in the form of a giant tube pouring beer into the crowd and several foam cannons. The set was light-hearted and fun, asking the important in Warum (Why) including “why can’t we ride bears to work?” and an entire song about the benefits and uses of wood, which in German is entirely free of innuendo. After their performance last year got cut short due to extreme weather, they vowed that this time we would party to the absolute limit. And we did. As we headed to the Green Stage we were greeted with the complete opposite of the 257ers,with Clueso on the stage. As a much-needed calm after 257ers, the mix of pop, hip-hop and reggae got crowds singing and swaying. His performance of Zusammen (Together) was a surprise as it appears on the new album by Die Fantastischen Vier featuring Clueso. Considering that the former are due to play on Sunday I would have expected it in the headliners set. But Clueso made it a loving tribute by including verses from some of their best songs, and the crowd loved it. A weather warning for the approaching storm had been in place from the start of the set. As the first notes of the final song –Verlierer (Loosers) – sounded, the stage and crowds were bathed in blue light, and the heavens opened. The crowd, undeterred, turned into a sea of complementary, red ponchos and carried on. The Ferris wheel and giant wooden Jägermeister Stag with flaming antlers made an impressive backdrop for the Dropkick Murphys, made even more dramatic by the lightning storm in the background. Much in the vein of Gogol Bordello, the bands Celtic punk moved to crowds to dance the rain away. In an ambitious attempt to pull off a semi-acoustic set at 22:30, Alligatoah invited us down into the sewers with him via an impressive stage design. Sporting the appropriate blue overalls, flatcap and yellow wellies and accompanied by an electric organ he worked his way through funky versions of his discography. His songs dripping in irony about society including beauty standards (Du bist schön (You are beautiful)), throw away culture (Lass liegen (Leave it)) and most ironic of all, the music industry Musik ist keine Lösung (Musik isn’t a solution). Being an acoustic set, he relied on the crowd to sing the electric guitar part of Willst du (Do you want to), and they were more than happy to comply. Help was again required for a verse of Trostpreis (Consolation Prize), sung by Timi Hendrix on the record, and the audience performed flawlessly. Rounding off the first night, the Canadian Billy Talent took to the Green stage. A staple of the Festival circuit and currently touring their fifth studio album “Afraid of Heights”, the band returns to Highfield for a second year running as their set was cancelled due to heavy thunderstorms last year. Lead singer Benjamin Kowalewicz worked the crowd, who responded singing back at him. Finishing with Red Flag and Fallen leaves, the set was worth the one year wait for sure. The plan for Saturday morning was obvious. Get out of the boiling hot tent and go swim. By no means the first with the good idea, the beach was already filled at 9:30 in the morning. The air was a little cooler, but the water no less refreshing than yesterday. Some people were playing beach volleyball, some lying on beach towels playing cards. Crepes for breakfast (what else?) and we headed down to the main site. We dipped into Swiss und die Anderen, heavy Antifa punk rap. Not our cup of tea, although the crowd was absolutely loving it. Mosh. Pits. Everywhere. Next up on our timetable was Sondaschule, the punk-ska band from the so called Ruhrgebiet, an area famous for its former coal industry. Whether it was the band itself or the following headliners was uncertain, but the crowd had definitely become more punk heavy. From colourful mohawks the leather jackets, the tone of the evening program of the Green stage was set. When the band dedicated a song to what they considered the most beautiful city in the world, the girls near the front holding a “Mühlheim Ruhr”, the home city of the band, sign got excited. But instead of the song of the same name, the chilled reggae beat of Amsterdam began to play. Showers of confetti exploded from the crowd. It’s quite common for German festival guests to bring bags of paper confetti. It makes for great atmosphere and is 100% biodegradable. A win – win. The band thanked everyone for the warm welcome for their first time here at Highfield. Towards the end of the set the band introduced a song from their new acoustic album, the song RIP Audio, which they recoded together with Ingo from the Donots, who had not arrived on site yet. Once again, the crowd stepped up and took over the guest vocals. Lunchtime came around and it was finally time for the burger we had travelled over 700 miles for. The wild boar burger from the Hirsch&Eber stall. With onions cooked in port and a cranberry mayonnaise it is without a doubt one of the best burgers I have had to date. If you want to argue with me on that, you can come to Highfield next year and try one for yourself. Bad Religion were meant to play Saturday afternoon but had to cancel at short notice due to a family emergency. Instead, German festival veterans the Donots stepped up and filled the slot. Undoubtedly leading to one of my personal highlights. The crowd welcomed them with open arms, chanting their name at every opportunity. Lead singer, Ingo Donot, told us they had struggled to get a bus in time and almost didn’t find a dog sitter in time leading to Wake the Dogs. Highfield festival had been working with Viva con Agua, a charity providing clean water across the world, for many years. Besides a stand where you can donate there are also people around the site with bins where you can donate your cups and corresponding Pfand. The band got circle pits forming around the bins encouraged everyone to donate their cups while playing Do what you want, a cover to console the Bad Religion fans in the crowd. Ingo is everybody’s hype-man, excitedly announcing all their friends who were still to play this weekend. This included Flogging Molly whose bassist, Nathen Maxwell, joined them on stage for Kein Problem (No Problem). Finishing the set with So long, the crowds chanted the chorus long after the song had finished, moving the band to tears. It’s fair to say that no one regretted the substitution. Later, the Swedish garage rock band The Hives took to the Green Stage. The most strikingly dressed of the weekend, everything was black and white. The suits, the guitars, the backdrop. They also had a crew of ninjas doing all the cable management and guitar swaps. The securities in the pit did their best to keep the crowds cool, throwing and handing out water. Lead singer, Howlin' Pelle Almqvist, went straight into the crowd, wasting no time to get acquainted. The music was fantastic, raw guitar riffs and hoarse vocals. Everything between became a little tedious. Coming across somewhat arrogant, Howlin' Pelle constantly demanded the crowds cheer, even starting his own encore chant. At some point the audience had had enough, not really responding anymore. A shame, since everyone still had a great time with the music. This year’s Saturday headliners, the Broilers, can in many ways be considered the descendants of last year’s Saturday headliners Die Toten Hosen. They started out as their support act, being mentored by them and signed to the DTHs own record label. They had big boots to fill, with many people questioning if they were ready for the headline slot. But once they got started, all doubts subsided, and they stepped up flawlessly. Their horn section giving them their trademark ska-punk sound, the crowd was loving it from the get go. When you have a horn section, clearly the natural thing to do is cover the Ghostbuster theme tune. The Broilers are a band where dancing and moshing are equally valid ways to celebrate their music. Small moshpits here and there, but also a paramedic on a break dancing with his girlfriend. It felt like everyone was welcomed into the Broiler family that night. The mood then got more serious with the more recent song Keine Hymnen Heute (No hymns today), a song describing the prohibition of a lot of art during the second world war. The backdrop showed videos of Nazi soldiers burning books as a grim warning against populism and rising right wing sentiments. The pyrotechnics sounding like gunshots. What followed was undeniably one of the most emotional parts of the festival. During Ihr da oben (You up there) the screen showed a collage of photos the band had asked fans to send in for the music video. It showed loved ones that had passed away. The range of photos was particularly striking, as it included young children and babies alongside grandparents. It really drove home the momentous amount of loss and grief contained in all those images. The tempo picked up again with Held in unserer Mitte (Hero in our midst), with circle pits forming around the bands handpicked audience members. The show finished with fireworks and I think everyone agreed, the Broilers are headliner material. As is tradition at German festivals there was a general protest against the far right and populism. Whether its moshing against (and on) Nazis, the antifascist charity “Kein Bock auf Nazis” or anti-nazi chants. Many bands had banners saying “Refugees Welcome”. As people were chanting “Nazis out”, the Donots quite rightly pointed out that people needed to go shout these things at counter demonstrations, not just here, where there were no neo-nazis. Sunday started the way all festival Sundays start, the long arduous treck back to the car, laden with bags. The weather was even hotter than the past few days, making this by far the worst part of the experience. Oh the price you pay for camping close to the site and far away from the car park. Once that was over we could get back to the good bit. Sunday afternoon was brit indie-pop time on the Blue Stage. Maximo Park’s Paul Smith overdressed, as always, in a blue suit, hat and shades. Dancing enthusiastically through a set spanning all six studio albums, the band started on Girls who play guitar and finished with Apply some pressure. The crowd favourite was definitely Books from boxes. Throughout the set Smith addressed the crowd in broken but endearing German, making sure everyone drank enough water and were having a good time. A black backdrop with a hypnotising wombat with rainbow eyes marked the next band. The Wombats started out with the lively Cheetah Tongue. The audience had a surprising knowledge of all the songs, singing along and dancing. The award for most crowd confetti thrown definitely goes to The Wombats, with the stuff flying left right and centre. We learnt intimate details, like the argument score between lead singer, Matthew Murphy, and his wife stands at roughly zero to three million. The band also introduced Steve, “The hardest working squirrel in Europe”, who was a plush sitting on the drum kit. Naturally met with chants of “STEVE, STEVE, STEVE”. The next album will be consisting of elevator music, the demo of which promptly turned into Moving to New York. The set peaked with Let’s Dance to Joy Division, causing the biggest explosion of crowd confetti yet. It was a perfect summer afternoon dance party. By the time Madsen came onto the Green stage, everything was bathed in golden light from the setting sun. Their backdrop a space shuttle from their new album “Lichtjahre (Light years)”, the band celebrated the bassists birthday and started the first ever ladies only circle pit I’ve seen. By the side of the first wave, two little girls in giant fluorescent headphones were dancing away when a security guard called them over to give them each a carton of water. They repaid him with a handful of confetti. A fair trade I’d say. Halfway through the Madsen set on the Green stage, the Editors took to the Blue stage. Seeing the meagre crowd they were about to go on stage for almost made you feel sorry for them. The backdrop, taken from the cover from their latest album “Violence”, was a dark picture of contorted bodies. Although mildly distressing, it does fit the general vibe of the band. They walked on in silence and started to play their first song. Afterwards the lead singer Tim Smith said a shy “dankeschön, guten abend” and carried on. As the set progressed he seemed to warm up to the crowd, addressing them more freely and encouraging them to put their hands up for songs. His motions across the stage were creeping and primal, almost mesmerising. The crowd had gathered as the set went on, so by the time Papillon started, there was enough of a crowd to properly welcome their favourite. Jumping, singing and waving hands in a butterfly like fashion as the sun set on the final festival day. Which of the two stages hosted the true headliner is up for debate. The Blue Stage, pioneers of German rap, Die Fantastischen Vier were scheduled to play right up until the point that one of the biggest German rappers right now, Materia, was to take to the Green stage and give the festival the finale it deserves. It was clear the crowds were torn. Get a good spot for Materia and miss out on the band without which he wouldn’t even exist? See the undisputed bedrock of the genre and miss out on a spot in the midst of what promised to be the craziest party of the weekend? Enough people decided on the latter, the first wave being packed like never before. A huge banner of the new album, “Captain Fantastic”, covered the stage. As the first beats of Tunnel boomed across the grounds, the banner came down to reveal the band, already hyping the crowd. The crowd were with them from the first song with more energy than I’d seen for anyone else this weekend. The backdrop was a rectangle of screens with a fabric banner in the middle, an unusual set up. The hype kept up for about ten songs, the group behind me insisting to express their excitement through five-man moshpit. The set slowed down in the middle with Tag am Meer (Day at the Seaside) which was a shame following the energetic start. Normally, a calm song or two gives to audience a chance to catch their breath. In this case, people started leaving to go to the other stage. As the show went on, the tempo picked up again. Zusammen (Together) was performed for the second time this weekend, this time with Clueso singing his part via video on the screens on stage. The band left the stage before the three-song encore, at which point they started haemorrhaging audience members. At this point they were clearly going to run over and into the set time of Materia. The proximity of the sets split the audience and to me that was the biggest failure of the organisers. The remaining crowd went mental for the encore, more than making up for their decreased numbers with their energy. The set finished, and everyone rushed to the Green stage to hear the last lines of Materia’s Endboss. Even though only two songs had passed, the crowd was already warmed up and ready to riot. Bengalische Tiger (Bengal Tigers) caused red flares to erupt in the crowd and on stage, making for a spectacular view. The melancholic Tauchstation, which is an an idiom meaning secluding yourself, bringing everyone back down with its hypnotic, submarine-like sounds, followed by the ode to the Blue Marlin. The deep bass vibrating everything in reach. At this point, Materia took a moment to thank Viva con Agua for their work and encouraged everyone to through their cups on stage on the count of three. This led to the bizzare spectacle of plastic cups flying through the crowd, rarely reaching the stage, instead being picked up and thrown further forwards. It looked like hundreds of tiny plastic dolphins, making their way to the stage. Given the value of 2 euros per cup it was likely 1000 euros worth of donations flying about. Talk about making it rain. Materia is currently promoting his joint album with Casper, “1982”. Both were on site together earlier in the day giving autographs and taking selfies with fans. It therefore came as no surprise to suddenly see the two on stage together performing the first joint single Champion. None the less the crowd flipped, making it clear that this collaboration is hotly anticipated. The mood remained ecstatic as the duo performed their second single Supernova. As a crowning finale to the joint performance, they premiered their third song Adrenalin. On top of the first reveal, the two also announced they were filming the music video at the festival. Naturally, the crowd pulled out all the stops, no doubt providing a sensational backdrop. From there on, the set escalated from song to song. One hit after another, culminating in Feuer – Fire, obvious pyrotechnics included. Materia’s alter ego Marsimoto made an appearance for a verse. Cloaked in bright green smoke and wearing his metallic green mask his arrival caused a brief change of pace before returning to the high-octane finale of Feuer. Finally, Materia teased every last ounce of energy out of the crowd with his Letzte 20 Sekunden (Last 20 seconds). The audience jumped, waved and threw shirts, moshed and tore the place apart. At one point the show master himself descended from the stage to party with his fans, right in the centre of the first wave. It seemed neither crowd nor band wanted it to be over. Materia dancing with his band on stage, waving a Rostock football flag and hugging everyone. It was a night that no one wanted to end. 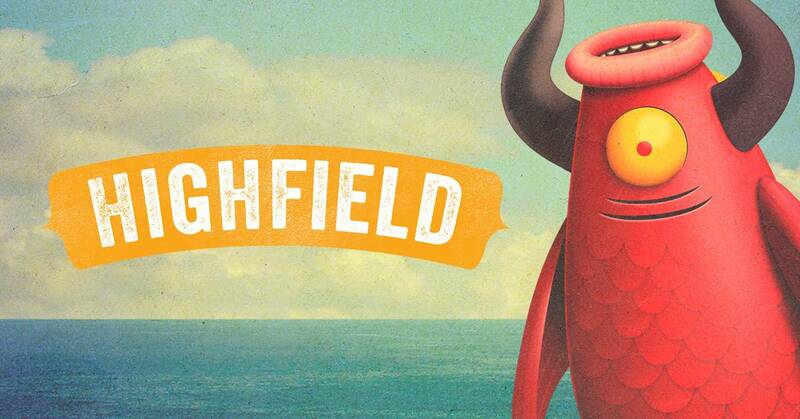 The Highfield festival is too small to draw an array of big international names, maybe getting one per year. Personally, I think the appeal lies in the atmosphere. The beach makes it feel more like a holiday and the line-up is one you can dip in and out of without the notorious fear of missing out that plagues big festivals. If you’re into German music then you’re guaranteed to find something, including high calibre performance. It’s a niche for international visitors, but definitely worth checking out if you fancy a chilled weekend by a lake with mostly great weather.